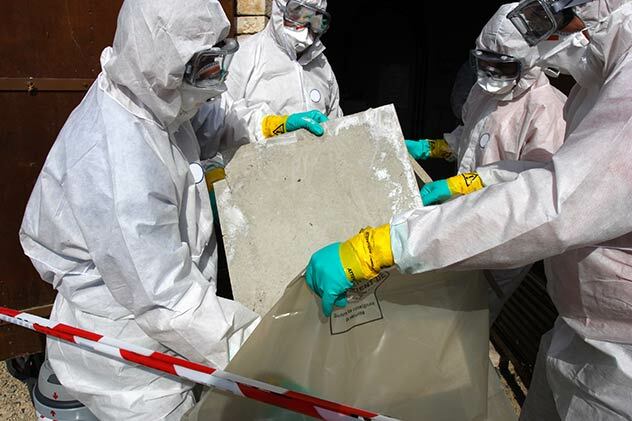 If you require professional asbestos removal in Weybridge, you have come to the right place. Our licensed asbestos removalists can provide safe and thorough asbestos removal for your property. We work with all types of properties, from small homes through to large hospitals, and provide asbestos removal in Weybridge to both domestic and commercial clients. No job is too big or too small for our licensed asbestos contractors. After removal, the air quality will be tested to ensure there are no asbestos fibres remaining. This will ensure the job has been safely completed, and the property is safe for use. If asbestos removal is not the best management solution, we can also provide encapsulation. This is cheaper than removal, and involves a resin coating being applied to asbestos containing materials to ensure the dangerous fibres do not escape. Your initial survey and assessment will help determine what the best solution is for any asbestos found in your property. For the best asbestos removal in Weybridge, with competitive pricing and qualified professional contractors, look no further than the Asbestos Removalists – request a quote. If you suspect an asbestos containing material in your property, we can provide an asbestos survey. This will confirm the presence of asbestos, if any, in your building, and provide guidelines on how best to proceed. When asbestos is found, it is normally either removed or encapsulated. In some circumstances, where the asbestos containing material does not pose a threat to the inhabitants of a property, it can be left undisturbed. There are a number of factors that are likely to influence the cost of your project. Different asbestos services cost differing amounts, with sampling being far cheaper than asbestos removal in Weybridge. For competitive pricing and a high level of workmanship, please request a quote. If your asbestos has already been collected, and simply needs to be disposed, we can help. We offer a full range of asbestos disposal services, which follow the correct Health and Safety Executive (HSE) procedures to ensure that your waste is properly treated. As asbestos is extremely dangerous, it must be disposed of correctly. We will ensure that your asbestos is properly disposed of, and prevent any health risks from arising. Asbestos testing is one of the cheapest asbestos services available, and helps property owners determine whether a material contains asbestos. Collecting samples can be dangerous, and potentially release fatal asbestos spores into the air, so we recommend using a professional service, such as ours, for your testing and sampling. 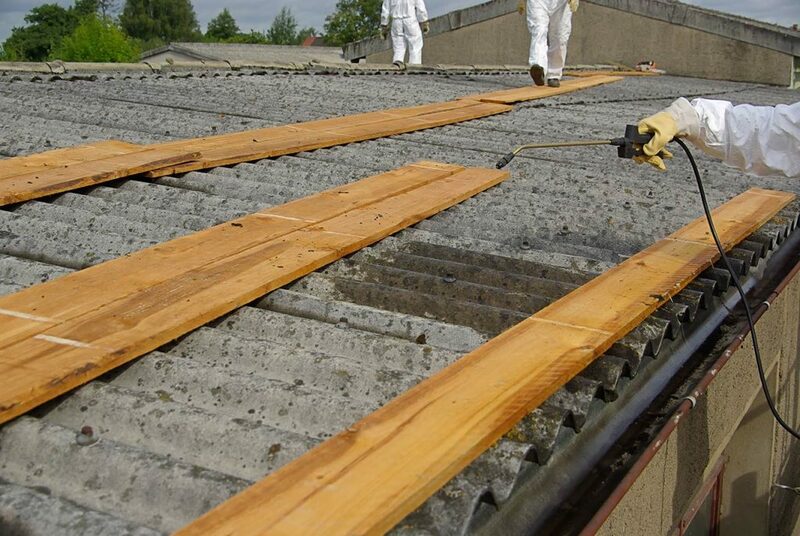 As well as our services mentioned above, we also provide asbestos management in Weybridge. Ongoing asbestos management is required for asbestos that has been encapsulated or does not pose a risk, so has been left in place. This service often involves ongoing surveys and testing, as well as a management plan to ensure the asbestos will not be a danger to the property’s inhabitants. If the asbestos in your property becomes damaged, or starts to decay, removal may be required. As part of your management, the risks of asbestos will be assessed. We provide management services to both residential and commercial clients throughout the UK. Asbestos was often used as an additive for a number of different products, ranging from decorative ceiling textures to vinyl floor tiles. This makes it hard to identify asbestos in your property, as it can often look like products that do not contain asbestos. Asbestos was a popular additive as it has a high resistance to heat, chemicals and deterioration. It was sometimes used in its pure form for different purposes, such as loose fill insulation. We have put together a helpful page on how to identify asbestos in your property. The Asbestos Removalists provide advice and nationwide asbestos services to commercial and domestic consumers, both in the UK and internationally. We have put together a lot of useful information, extensive photo galleries and fun infographics, so have a look around our site, or request a quote for a local and licensed asbestos contractor. The Asbestos Removalists provide a range of services related to the asbestos industry, from guides and advice to professional service contractors. We aim to provide consumers and workers with helpful advice and information on asbestos, from identifying possible asbestos containing materials to limiting the risk of exposure. As well as providing informative articles, we also provide professional and licensed asbestos service contractors. Our contractors provide all types of professional asbestos services throughout the UK, including; removal, disposal, management, encapsulation, testing, sampling and surveys.